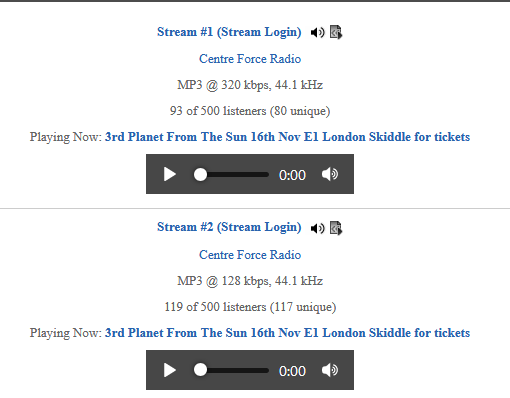 I never knew that I only remember the original broadcasting on 88.75 from 88 till early 94 and when the BBC put 88.8 fm for radio 2 from crystal palace they moved for a very short time to 88.4 and closed down I didn't know anything about sunrise after that till the online version we have now. So what year was the link up with the other station? Pure wtf u on about, no one has moaned at all on this thread fella, I've even agreed with comments from you on here. Wind your neck in and think before you moan off...if it was due to the fact I wrote about ads being played so be it, I wasn't complaining just stating a fact that i heard ads, what I find strange tho I've not heard them since !! I am still wondering what year sunrise teamed up with innocence fm? Okay thanks for that was it online or fm and if fm what was the frequency? Huggs n Seeka returning next week I hear. Just gets better n better . Are they Londonwide dab or inner London only? I've really enjoyed Centreforce tonight. This is fast becoming my favourite station. I'm not in London so rely on the web stream.